Young Texas livestock exhibitors get a unique experience each winter and spring, with the opportunity to compete in the six “Texas Majors” throughout the state. These six shows are the culmination of months of hard work, hours upon hours in the barn, proper feeding and management and at most shows, the chance to showcase just one market animal, amongst hundreds of others for a chance to claim one of the top two prizes of Grand or Reserve Grand Champion. “I was so excited I couldn’t think straight for a solid two days,” Ethan said when judge Kevin Jensen selected Ranger and shook Ethan’s hand indicating he had just won this monumental honor. Ethan, a sophomore in high school, said that he had a total of 11 steers in the barn that he’s worked with the past year to show at the various county fairs and Texas Majors. He showed Ranger just one other time, at the West Texas Fair in Abilene, but has been keeping him in the barn, working on him for Houston. He said he had no idea that he’d do that well after he won his division. Ranger was born and raised on Ethan’s family cattle operation, 1Eleven Cattle Co. Ethan worked with him daily to make sure he received the best care possible, including getting him in every morning to stay out of the heat and avoid sunburn and rinsing and conditioning his skin after school. All Texas Majors, except Fort Worth are ‘slick shear’ shows, so working hair was not a priority, but keeping his skin conditioned was. “What makes the slick-sheared shows so special is you can see what the cattle actually are, instead of what they look like with a bunch of hair, so it has made the cattle better. But I do like showing a really good-haired one too,” Ethan said. Part of Ranger’s daily care encompassed his nutrition program that included Sure Champ® Extreme with Climate Control and Vita Charge® Liquid Boost®. Both the Sure Champ and Liquid Boost contain Amaferm®, a precision-based prebiotic that impacts intake, feed digestibility and nutrient absorption for optimum digestive health and performance. 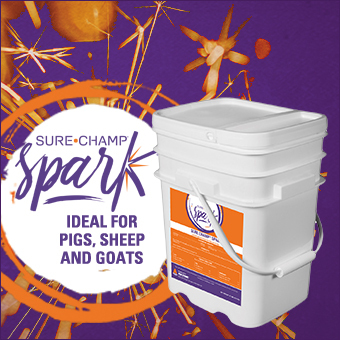 The Sure Champ Extreme also contains ingredients designed to help support animals during extreme temperatures, biotin and zinc to support healthy skin, hair and hooves, and garlic, which is known to act as a natural insect repellent. In addition to the Amaferm, both products also contain MOS to trap and expel pathogens, limiting their ability to do harm, and helping to keep the animals at their healthiest. “Our summers get extremely, extremely hot, and we noticed with the Sure Champ Extreme with Climate Control that in the summer our steers don’t go off feed, and they never lose weight. The Liquid Boost helps with their appetite and makes them want to keep eating,” Ethan said. He said his family has always used the Liquid Boost on their show animals, and just this past year switched from the Sure Champ Cattle to the Sure Champ Extreme. He said it is a part of their preparation from the beginning to the final show. As for his future, he’s already started getting in and working on next year’s steers. He said after high school, he’d like to attend Kansas State University, major in Animal Science, and then return to 1Eleven Cattle Co.
As for his week in Houston, it is one he surely won’t forget for a very long time. He said the sale of his steer happened so fast, it was just a blur. It set a world-record, and though Ethan only receives a portion of the proceeds, he appreciates all the buyers who support Texas youth and their livestock projects. “And I’d like to thank my parents, Eric and Marissa, and everyone that has helped me in the barn this past year and a half. I really couldn’t have done it without them,” he said with a smile. Hard work, hours in the barn and good nutrition all helped Ethan Drager find his spot in the Winner’s Circle at the 2019 Houston Livestock Show. Congratulations Ethan! 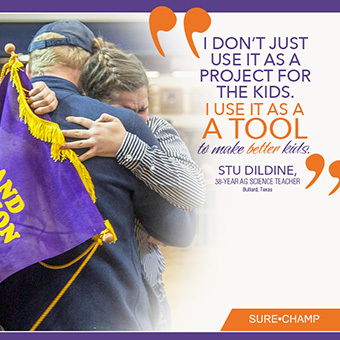 And thanks for using Sure Champ to help you #preptowin. EVERY.DAY.